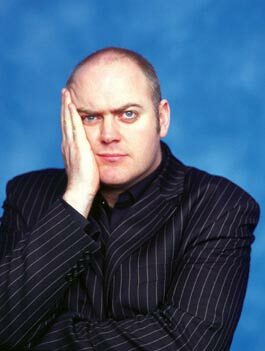 U2, Guinness, Roy Keane - you might as well start adding Dara O'Briain to that list of great Irish Exports. Back home in Ireland O'Briain sells out theatres and is a national comic genius and it wasn't until he presented the Live Floor Show earlier in the year that he started to make in-roads over here in Blighty. Designer Magazine caught up with Dara as he prepares for another legendary Edinburgh Festival run which sets to build on his sell out success of 2002. Q: Live Floor Show - the place where Dara O'Briain launched himself into the nations consciousness. It must have been the first time stand up comedy was given a profile before midnight on mainstream television? A: It takes a few years of doing a show like that for anyone to really get to know your act. It was the first time in a long while that TV companies had actually tried to do a live stand up show, because of most of the shows previous had just been a showcase in an existing club with cameras buried deep within the walls. In fact it was the first time since Saturday Night Live and the head of BBC Scotland was the producer of that and the Live Floor Show was meant to carry on in that tradition. Q: People have been saying that 2002 and 2003 have seen a renaissance in British Comedy. Even though you're just starting off in England, you're massive back in Ireland. How long was the journey to become one Ireland's most successful exports? A: I actually got into comedy because I used to debate at college, college debates in Ireland are huge things with about 400 people in the audience, and I used to do that and do it in a funny way. Some guy asked me to MC in a club and with comedy everything is in baby steps - you never think I will do this and in 7 years time I will be hosting a show on BBC2. The whole world of comedy is about luck and whether you're jammy. The last gig I did before this was the end of my tour playing to 900 people in the Olympia Theatre in Dublin, so to come over to England is from the sublime to the ridiculous. Tonight, I was at six or sevens because it was my first gig after doing my own tour so I was still in my "Irish - you all know me" as opposed to "Your English - and you don't have a clue who I am". Q: Going back to those early gigs what were they like. If you're a band you can just rip off the Beatles or Stones, but with comedy surely it's not like that. Or Is it? A: You still do. A lot of comics will borrow one or two jokes at the start. I borrowed one or two of Emo Phillips'. But the problem is, and you're the first person I've admitted that to, is it's not a smart thing to do because you're in the middle of your set and suddenly there's an incredibly f**king brilliant funny joke and it's obvious you've stolen it from someone else. I actually had the good sense to steal it from an American comic who didn't work in Dublin...but even in a circle as small as Dublin there would be comics who nicked jokes from other comics in Dublin and the guy would actually be in the room saying that's mine. You could never do Pop Idol for Comedy because you've just got to go out and do loads and loads of gigs. There's a lot of people working on television you'd love to see do a live gig, especially daytime television presenters, and just watch how their banter falls in front of an audience. Comedy is good for that because you'll be told pretty quickly if you're not funny and it doesn't matter how big you are - with every new joke you're back to the beginning again. Q: I believe you're working on an Irish TV Show that is nothing at all like an Irish version of the Kumars. Would you care to elaborate? A: Were trying to do that...although it might end up being an Irish version of the Kumars because were at a very early stage. In Ireland there are a load of really funny people who you've never seen and we want to get them and show them to you.